Time: Please call for times. 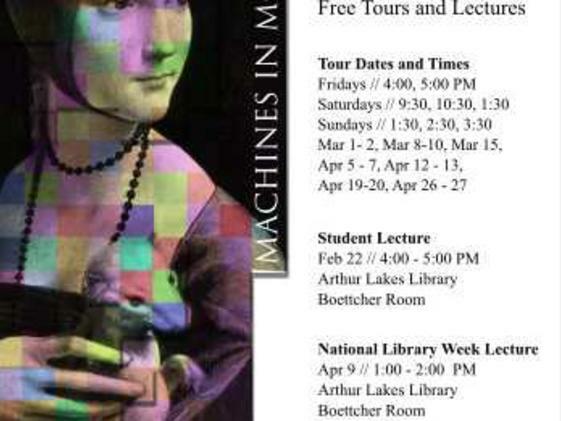 The Art of Innovation: DaVinci and Michelangelo and Machines of Change: The DaVinci Machines. 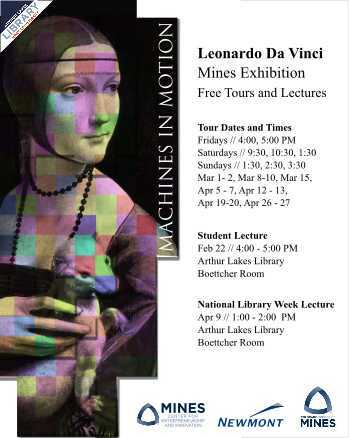 These exhibitions are free and open to the public, and will allow Mines students and visitors to explore attributes of DaVinci that resonate to a modern entrepreneur. Together, these exhibitions will provide tremendous insight into the innovation process and create an understanding of DaVinci as a 15th century technical entrepreneur! Join us to create a stunning visual portrayal of the innovation process as it was originally developed almost 500 years ago! Explore the vision and process of one of the world’s most recognized inventor and artist, and understand the contrasting approaches developed by Michelangelo and DaVinci. The Art of Innovation Exhibit will take place in the Arthur Lakes Library, where over 30 high-resolution digital reproductions will be on display throughout the main level of the library. Viewers will be able to listen to an audio self-guided tour to learn about DaVinci’s entrepreneurial spirit and application of innovative techniques in the creation of these masterpieces. Full-size reproductions of the Mona Lisa, Last Supper and other classics will be on display along with a special collection of a dozen high-resolution prints of Michelangelo’s paintings on the ceiling of the Sistine Chapel in the Vatican.